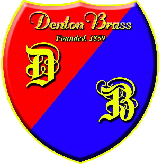 Denton Brass does not receive sponsorship from any organisation and is entirely self financing. In order to raise awareness of the bands activities and raise much needed finances for the band, Denton Brass Band invite members of the public to become a “Friend of Denton Brass” providing an opportunity to support our local band and be kept in touch with events relating to the band and it’s activities throughout the year. For a low fee of £10.00 (minimum donation) per year anyone can become a friend. In return, friends receive a quarterly newsletter giving details of what is happening within the band and details of concerts and contests in which the band is taking part.